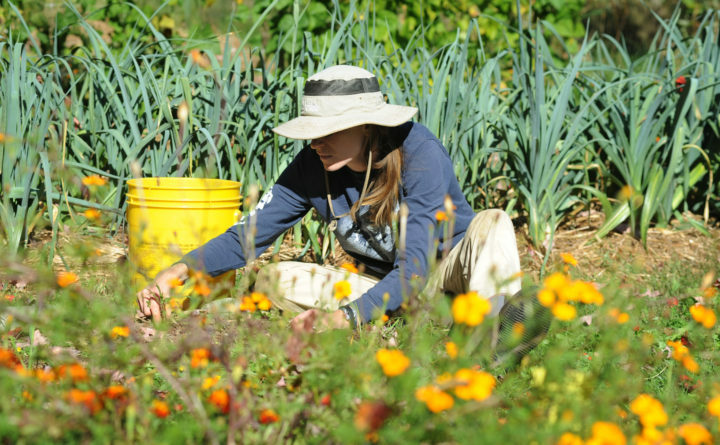 A woman works in her garden, Oct. 3, 2013. It is no secret that gardening is good for your health. By growing your own food, you ensure access to healthy, locally grown options free of pesticides and other chemicals (as long as you don’t use them). Gardening is also a work out, classified by the Center for Disease Control as a moderately intense physical activity that can help reduce the risk of obesity, high blood pressure, heart disease and stroke. But did you know that gardening can have mental health benefits, too? A 2010 study showed that patients with clinical depression in who participated in routine gardening activities experienced a reduced depression and increased attention capacity that lasted months after the program ended. A 2006 study showed that gardening on a daily basis reduced dementia risk factors by 36 percent. The connection that gardening provides with the natural world is the source of many of its mental health benefits. A 2010 study shows that 30 minutes of gardening decreases more stress than 30 minutes of indoor reading. Mycobacterium vaccae, a bacterium in soil, has also been found to trigger the release of serotonin, which in turn improves mood and possibly even brain function in both cancer patients and mice. Part of the mental health benefit also comes from the physical activity associated gardening. Exercise releases endorphins that help mitigate the effects of depression and anxiety. The positive mental health impacts of gardening have led to a rise in the popularity of horticultural therapy, a guided practice of using gardening to help manage mental health issues. A 2014 review of horticultural therapy research concluded that although the existing research is insufficient to say anything definitive about the mental health benefits of gardening, horticultural therapy may be an effective treatment for mental and behavioral disorders such as dementia, schizophrenia, depression and terminal-care for cancer. Even if you do not have access to a horticultural therapist, these experts have some tips on how to maximize the benefit of gardening to your mental health. “I think it’s about consistency,” Capra said. She recommends maintaining regularity in your gardening habit — for both the health of your plants but also so you can reap the mental health benefits.